First, bookmark this page by pressing Ctrl-D for Windows or Command-D for Mac. Please consider us when you shop on Amazon and help us raise funds toward finding a cure for DIPG. You will need to click on the banner below to get to Amazon before you start shopping. As an Amazon Associate, Marc Jr Foundation will earn advertising fees from your qualifying purchases. Thank you for supporting Marc Jr Foundation!!! Marc Jr Foundation has participated in Amazon Associates program, an affiliate advertising program designed to provide a means for sites to earn advertising fees by advertising and linking to amazon.com. As an Amazon Associate, we earn from qualifying purchases. Below are some Frequently Asked Questions that we hope will resolve any questions you may have about this important fundraising program. If your question isn’t answered below, please email us at info@marcjr.org. What is the Marc Jr Foundation Amazon Associates program? Marc Jr Foundation has participated in the Amazon Associates affiliate marketing program. It allows us to raise crucial funds for the Foundation. Where does the advertising fees come from? Advertising fees comes from Amazon. Amazon gives us a referral fee for sending customers to their way via our website. How do I shop on Amazon to support Marc Jr Foundation? It is as easy as clicking on the above Amazon banner or this MarcJr-Amazon link and making purchases on Amazon. When you click on the above Amazon banner or this MarcJr-Amazon link, you will land on the Amazon Smile page. The first time you visit this page, you may need to log into Amazon account and pick a charity to support. Please select "Marc Apodaca Jr Children's Glioma Cancer Foundation" as your charity of choice on Amazon Smile, and our Foundation will receive an additional 0.5% of your eligible purchases. Now you are all set! Shop as you normally do, knowing that you are supporting our Foundation at no additional cost to you. Will I be charged more for Amazon products and services by purchasing via the Marc Jr Foundation link? No, there is no cost, markup or additional fees when purchasing through MarcJr-Amazon link. The price and shopping experience through Amazon.com is exactly the same as it would be if you went to Amazon directly. Remember to use the MarcJr-Amazon link. Will my purchases be kept confidential? Yes, only Amazon is aware of who purchased a product or service. The Marc Jr Foundation is notified that a product or service has been purchased for reporting purposes, but names or account numbers of the individual purchasers are not shared with Marc Jr Foundation. Absolutely! All purchases are made through Amazon.com. No account, payment, or order information is collected or processed by us. It's exactly like shopping directly through Amazon.com, except that we receive a advertising fee of your purchase when you access Amazon through our website. Free to you, invaluable to us! Why is the link taking me to the Amazon Smile page? In the above Amazon banner and this MarcJr-Amazon link, we have combined the Amazon Associates and Amazon Smile programs into one link. Marc Jr Foundation is a 501(c)(3) non-profit organization, which allows us to combine the returns from both programs. The link takes you to the Smile site because that is how Amazon can track both programs at once so we can receive the combined returns. How do I know the Amazon link on the Marc Jr Foundation website is working? Whenever you shop on Amazon Smile, if you have chosen us as your charity, you will see “Supporting: Marc Apodaca Jr Children's Glioma Cancer Foundation” on every page, which confirms that you are contributing to the Foundation with your shopping. You can also highlight the URL on the Smile landing page, and if you see the text "tag=marcjrfound0f-20" in the URL, you know the link is working. Can Family and Friends participate? Yes. This program is open to family, friends, relatives or anyone that happens to navigate to the MarcJr-Amazon link. Yes, please share MarcJr-Amazon link with family, friends, relatives, and anyone who would like to contribute to our Foundation. There’s no limit to how much we can raise. Why do I have to click through the Marc Jr Foundation website every time I shop? In order for Amazon Associates to track your purchases, you must use the Amazon link on our website. Any direct purchases from Amazon won’t count so please bookmark this web page and remember to click through our website to get to Amazon every time you shop! If I go straight to Amazon and fill my shopping cart and then click through the Marc Jr Foundation website to fulfill my purchase, will the Foundation get the return? No. The only way Amazon Associates can track your purchases is if you click through the Marc Jr Foundation website and fill your cart during that initial session and complete the purchase within 24 hours. If you skip the Marc Jr Foundation website and go straight to Amazon website to fill your cart, even if you click through the Marc Jr Foundation site later to complete the purchase, it will not count. Can I bookmark the Amazon page so I don’t have to keep going to the Marc Jr website? Amazon asks that we click through the above Amazon banner on the Marc Jr Foundation website every time we shop. You can bookmark this web page for your convenience. Does this program work for mobile purchases? Yes! From your phone, open www.marcjr.org/amazon and follow the normal directions of clicking through the Amazon banner, and your purchases will count towards our Associates/Smile program. Please don’t use the Amazon App on your phone as those purchases won’t count. Why can’t I shop directly on Amazon Smile? Amazon Smile only gives a 0.5% return so please don’t forget to click through our Marc Jr Foundation website so we receive the much higher Associates fee in addition to the Smile rate. 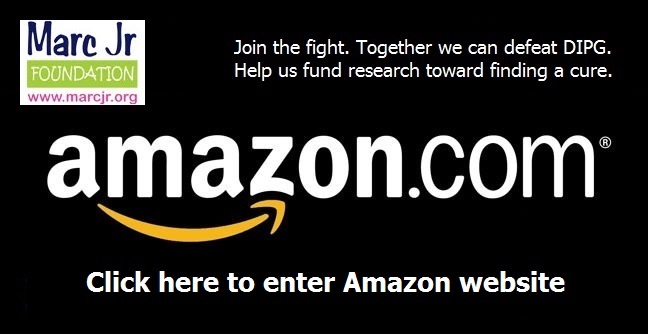 How does Marc Jr Foundation receive the money from Amazon?